Changing out bathroom flooring in rental properties is a costly undertaking. For anyone who’s tried it, the reason is obvious: the toilet is in the way. Junca Inventions Unlimited, LLC has developed and patented the world’s first toilet jack, and it’s a game-changer for apartment maintenance techs, plumbers, handymen, facilities managers, and do-it-yourself landlords. The Toilet Master Jack systems works on all floor mount toilets — round or large oval, all wall mount toilets, and public stall toilets as well. It lifts, tilts, holds, rolls, aligns, lowers and even inserts flange bolts on its own. That means all problems with lifting and moving toilets are a thing of the past. This handy system will prevent back injury, not to mention workers comp claims. 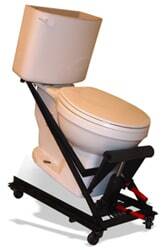 Users say there is no faster, easier way to lift and move toilets than with The Toilet Master Jack. A wax seal can be replaced in 15 minutes or less without picking up or moving the toilet by hand. The system makes easy work of replacement bath floors — workers can simply lift the toilet, roll it out, change the floor, roll it back and drop it down, without taking the toilet off the jack. It’s not surprising that apartment building owners are the largest purchasers on this truly unique invention. For more, including YouTube video demonstrations, visit www.thetoiletmaster.com — you will be amazed!